Andrea Willis Shot Inside Albany Gas Station Convenience Store; Justice, Compensation Available? Could this Albany convenience store shooting have been prevented and is justice available to the victim? Gunfire erupted inside a local convenience store Tuesday morning, May 29, 2018, leaving 32-year-old Andrea Willis critically injured, per WALB 10 reports. The incident comes only 10 days after another Albany gas station convenience store shooting claimed the life of Michael Taylor, per FOX 31 reports. 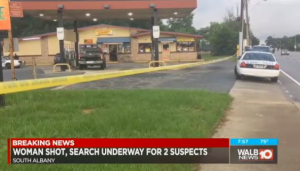 The shootings raise questions over gas station convenience store security measures in the area. Was negligent security a factor in this senseless Albany convenience store shooting and could this incident have been prevented? Read Our Legal Take below to find out if Ms. Willis may have legal avenues for justice and claims for substantial compensation in Georgia. Gas station and convenience store patrons have a right to feel safe and secure while on the premises. The Murray Law Firm questions the level of security provided at the subject property and whether this shooting may have been prevented. Have there been prior incidents of violence on or near property? What security measures, such as clear windows, metal detectors, surveillance cameras and security personnel, were in place to deter crime and protect Ms. Willis at the time of the shooting? By law, property owners in Georgia are required to protect all those legally on the premises from any foreseeable harm. Should the facts of this matter reveal that the business owner or management failed to provide adequate security, Andrea Willis may seek justice and elect to pursue legal claims for her injuries.